Adventures In Stoving: What's the Best Alcohol for Stove Fuel? A lot of people interested in going light are trying alcohol as a fuel. But if you head down to the store, you'll see all kinds of alcohol. Which alcohols are good choices for stove fuel? Which ones are poor choices? Alcohol as a Stove Fuel (in order of best fuel to worst fuel) The best alcohol fuel is ethanol (ethyl alcohol). It has the highest number of calories per gram* of any stove fuel suitable alcohol (I really don't consider dirty-burning isopropanol to be suitable as a stove fuel) and burns reasonably cleanly. If you can get lab grade "absolute" (200 proof) ethanol or 190 proof liquor, that's going to work really well, but both of those (lab grade absolute ethanol or 190 proof "drinking" alcohol) are pretty expensive -- if you can even get them. Lab grade absolute ethanol is often restricted as to whom can purchase it (i.e. not the general public), and many locations prohibit the sale of high proof drinking alcohol. Check the Materials Safety Data Sheet (MSDS) on lab grade absolute ethanol which may contain benzene which is toxic. Another option is "denatured" alcohol which should consist primarily of ethanol. The problem in the US is that there are no standards for what constitutes denatured alcohol. In fact, some denatured alcohols in the US are less than 50% ethanol. In addition sometimes nasty stuff is used to denature the alcohol (render it undrinkable), stuff like methyl ethyl ketone, whose fumes you don't really want to breathe. "Green" denatured alcohol generally has a much higher ethanol content and a lower "nasty stuff" content. Check the MSDS. The higher the ethanol content, the better it is for use as a fuel. Because higher ethanol content alcohol burns hotter, sometimes the burning will "get ahead of itself," and you'll get some soot. If the stove is overheating and producing soot, try adding water to the fuel (after you get into your camp site; don't carry it!). Adding water will calm down the burning, allowing the alcohol to mix properly with air and burn cleanly. Try adding a little water at first, and then add more water as needed to eliminate any soot (up to 25% of the total volume). "Green" denatured alcohol generally has the highest ethanol content. Outside the US, there is a particular variety of denatured alcohol sometimes available, methylated spirits. Methylated spirits is ethanol with methanol used as a denaturing agent. Methylated spirits is often called "meths" or "metho". Methylated spirits makes an excellent stove fuel. Would that it were available in the US. 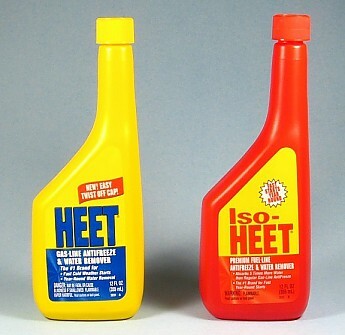 Methanol (methyl alcohol) is another popular fuel alcohol, frequently bought in the yellow HEET bottle because HEET is so widely available (at least in the US). You do have to carry a bit more methanol to do the same amount of cooking since methanol contains fewer calories per gram* than ethanol. Methanol fumes are toxic, and methanol absorbed through the skin is toxic. How toxic? If you're cooking out doors, I don't think fumes will be too bad if you're observant of wind direction and position yourself accordingly. I don't have a way to state a safe limit for skin absorption, but handling with care should be enough. It's not like you hear about a lot of through hikers on the Appalachian Trail (AT), where yellow HEET is easy to get and very popular, getting stricken with methanol poisoning. Methanol has a higher vapor pressure than ethanol and works better than ethanol in cold weather. I can't comment a lot on methanol performance in cold weather because I typically bring a gas or liquid petroleum fueled stove for cold weather. Conversely, methanol can have "runaway thermal feedback" in hotter weather. "Runaway thermal feedback" basically occurs when the alcohol gets so hot that it boils really violently and doesn't burn efficiently. Adding water (see remarks above) can help calm down a burn so that the alcohol can burn more cleanly. LAST choice is isopropanol (isopropyl alcohol). Isopropanol is easy to find at most any drug store (typically called rubbing alcohol), but it's usually a sooty mess to burn. Even though Isopropanol has the highest heat content per gram*, it is really not suitable as a stove fuel because it's such a mess to burn. Isopropanol is toxic in terms of both fumes and in skin absorption. Red HEET (i.e. Iso-HEET) is isopropanol. Not recommended. With any alcohol fuel, your flame velocity is going to be fairly low (think candle as opposed to blow torch). Therefore, an effective wind screen is really essential for an alcohol stove. 1. Lab grade absolute ethanol (200 proof) or high proof liquor (190 proof). High heat content per gram (relative to methanol), relatively clean burning, and generally non toxic, but check the MSDS on lab grade absolute ethanol which may contain benzene which is toxic. A good choice for warmer weather. 2. "Green" denatured alcohol in the US or methylated spirits (ethanol with methanol used as a denaturing agent) outside the US. Methylated spirits is often called "meths" or "metho". Good heat content, relatively clean burning, fairly non-toxic depending on the amount and type of the denaturing agent. In the US, always check the MSDS. A good choice for warmer weather. 3. Methanol, for example yellow HEET. Decent heat content, very clean burning, but definitely toxic in terms of fumes and skin absorption. Reasonably safe if used with care. A good choice for colder weather. 4. You can use Isopropanol, for example red HEET (Iso-HEET), but it is not really suitable as a stove fuel because it's generally a sooty mess when it burns. Highest heat content, but dirty burning, and definitely toxic. Not recommended unless you have a specialized stove specifically designed for it. Finally: Drinking anything not intended for human consumption is a really bad idea, but if you're going to do such a thing, always check the MSDS before you drink anything not intended for human consumption. Thanks for your comments. High proof vodka should work well as long as it's around 150 proof or so. Less than 150 proof might not have a lot of heating power. I'll have to check out your blog when I get a chance. There are very few locations that sell denatured alcohol with a significant ethanol content. The stuff you have pictured, the Kleen Strip Green denatured alcohol reports that it is >95% ethanol and the balance methanol. It is the only widely available stuff I am aware of. Lowes and Home Depot sell it. For priming stoves, I have found the 91% isopropyl alcohol is a clean and cost-effective alternative to methanol. I don't see much soot, though there is some. Some stores also sell a gelled ethanol stuff made for some sort of fire place. It comes in a liter bottle that looks like a big pop bottle. I once saw a WalMart store that sold a alcohol gel for starting a grill. It was primarily ethanol. I don't know if these leave any residue. One a cost basis, the high proof alchol sold in liquor stores will kill the wallet. I once found quart bottles of concentrated windshield washer cleaner. It was pure methanol with blue dye added. Nothing more. Burned great and I thought I was getting a bargain until I noticed the blue dye accumnulating. The other denatured alcohol that has good ethanol content is Sunnyside brand. That's interesting what you say about isopropanol being good for priming. I know it's not much good as an alcohol stove fuel, but for priming, maybe it'll work well. It certainly has plenty of heat content. I'll have to try it. You're right about high proof liquor. It makes a good stove fuel, but it is indeed expensive. can isopropanol not be "tempered" with water as well? To be honest, I haven't done a lot of investigating with isopropanol. What little I have done made me lose interest in isopropanol as a fuel. Being around it when it's burning leaves me feeling bad. I may try it some time, but there's more to it than just soot. Isopropanol is quite toxic. Golden Grain. A neutral grain alcohol. THE BEST. Although it is sold as a beverage...dont drink it!!! It is 95% pure alcohol which means only 5% is water. In other fuels water is in greater quantity (water does not burn and makes the flame colder duh)as well as some 'additives' which will kill you as in HEET. It costs .61 per oz. But on the trail, what difference does a few cents make when you get more heat, use less fuel, and you will be a much happier camper. Well, I'd encourage you to experiment with it. I've found that more pure forms of alcohol burn hotter and can actually be less efficient -- if your stove doesn't handle them well. Like I say, experiment with it. HEET is pretty safe for normal use. It's just methanol. But DO NOT drink it. One downside of all denatured alcohol brands here in Germany is that they have a very strong bitter taste. Even one drop on my fingers can taste very bitter if I eat something an hour later. Wow! That is bitter. Different countries use different agents to render fuel alcohol unfit for drinking. It sounds like Germany uses a bittering agent -- which is actually probably a good thing. The agent frequently used elsewhere, methanol can cause permanent blindness and even death. Germany's method is better in my opinion. I agree that the bittering agent is probably not harmful. It is used to strongly discourage drinking, but is not intended to make a person sick. Here is a alcohol stove fuel comparison video where six different fuels are directly compared. I just watched the first half. Interesting, but not conclusive -- the results are just for a Trangia. There are stoves, not many but some that will burn isopropyl alcohols efficiently. The results would be very different for those stoves. That said, most alcohol stoves, indeed the great majority, will burn HEET or denatured alcohol well and will not burn isopropyl well. 17 minutes! Yipes. Long video. :) I'll check it when I get a chance. Methanol racing fuel is the best fuel for stoves just because its so darn cheap. $4 a gallon. Its a lot cheaper than the other fuels mentioned. You can get it at shops that sell high performance racing parts. I am going to have to look into that. Thanks for the tip! If this double posts, sorry... login issues..
Have you tried burning it in a stove? It does work, but it leaves a hard to clean black soot on everything unless you have a specialized stove specifically designed for it. If you do use it and it's burning cleanly, what stove are you using? I bought some Moda Flame Bio Ethanol fireplace fuel 100% purity with 94% ethanol for ventless fireplaces. Has bitterant added to prevent kids and pets from drinking it. Says it' only puts off CO2 and steam like as much in exhaling a breath in combination and can be safely used indoors hence the free standing fireplace they make. I called a rep and they said the seen no reason it wouldn't work in an alcohol stove. I bought 3 quarts to try out in my Esbit and Fancy Feast stove. Best price is if you buy 4 gallons for $79.99 but wanted to see if worked well before that big of a buy. I use yellow Heet and Klean Strip Green atm. I'm spending close to that on Klean Strip Green at 28.00 gallon but this would be so much less toxic if it burns well. We'll see. Sounds interesting. Please let me know how it works out. Soot is formed by incomplete combustion. Both isopropanol (isopropyl) and ethanol produce soot when burned in air, albeit at different rates for the same conditions. You need four and one-half times as much oxygen molecules for each molecule of isopropanol as for ethanol. Consider that air is only 20% oxygen. You need a mass ratio of 9 to 1 air to ethanol. You need a mass ratio of 24.1 to 1 air to isopropyl. Experimental comparison of isopropyl and ethanol fires indicates that for the same geometric pool size, the isopropyl source will produce twice the heat output and twice the radiance of the ethanol source. Isopropyl will produce ten times the measured soot output. If a stove has been designed for ethanol fuel, the soot output will be too low to be observed. If you intend to use isopropyl fuel because of its far superior heat generation, you will need a stove optimized for that fuel if you want to reduce soot. You can also use fuel additives (one example is to add methyl alcohol) that suppress soot formation. Limiting air input with windscreens or by going up in altitude will increase the fuel-rich combustion and further increase soot formation. A stove optimized for isopropanol (isopropyl alcohol) will be able to use ethanol or methyl alcohol with some reduction in efficiency and operating conditions. Would a stove optimized for isopropanol be one that allows a lot more air (and thus O2) to reach the fuel? You have to do something. Either you figure out a way to increase oxygen flow -- or you slow down the rate of burn. The person who has been working successfully with this is Jon over at Flat Cat Gear. Google his Iso Clean stove (I think that's the name), and see what he's been up to. He has had good success. I personally haven't found using isopropyl to be worth the hassle -- yet. Since everything is in the gas phase, I'd focus on counting molecules ( = gas volume) rather than mass. Isopropanol needs 4.5:1 Oxygen to fuel. Ethanol needs 3:1 oxygen:fuel. So how to get more oxygen to burn IPA? More, smaller holes. Just like converting a stove or furnace from natural gas (methane) to propane. It's the velocity and surface area of that small jet of gas that mixes with atmospheric air. With a low-oxygen-need fuel, like methane, jet sizes can be larger. With a high-oxygen-need fuel, you need to cause more mixing with smaller jets. Try it sometime on a cat-can stove. Make one with small holes and another with more, smaller holes and compare them for soot formation. Smaller holes help (of course, the total area of your holes has to be balanced to the vapor produced and the heat output you want). I played with it a bit a few years ago. My experience was that air drafts would too easily upset the fuel air mix and turn things sooty. If the air were still, I could get a nice blue flame on 90% isopropyl alcohol, but a gust of wind, even a fairly minor one, would throw things out of whack. It didn't seem all that practical. Whats your take on Kerosene as a stove fuel. Hard to light, smells bad*, but high content per weight. Widely available around the world as a stove, heater, and light fuel. In *western countries, you can get a de-odorized version for lights, although it costs more in those quart containers than by the gallon from a fuel pump. A bigger issue is your style of cooking. Canister stoves allow you to turn the flame on and off very easily and that results in fuel savings (you can easily heat to boiling, let food soak for 5-10 minutes and then reheat if needed). Versus white gas and even more so kerosene stoves which are harder to relight (and potentially a little more dangerous to relight when warm or hot if you're not used to doing that) so many people turn them down to simmer instead of turning them off. Plus white gas and even more so, kerosene takes some fuel to get them primed (pre-heated), so that's a bit of wasted fuel each time. In my mind, kerosene is, or used to be*, a contender for world travelers. In North America, I'd use non-smelly butane-blend canisters or alcohol stoves and occasionally white-gas stoves (mostly for large groups). *all fuels are more available world-wide than they were in the 1970's. And it is harder now, post-9/11 to check a white-gas or kerosene stove as luggage, whereas a canister stove head is easy to check because it doesn't still have that "fuel smell". Thanks for your input on this. The one thing I might add to the discussion is that kerosene is a lot safer than either white gas or even canister gas. If kerosene leaks while you're cooking, it typically will not flash to flame. The same cannot be said for white gas or canister gas. Kerosene has a lot of negatives though. A stove has to be specially designed to handle it (many liquid fueled stoves cannot), it smells while burning, even when properly pre-heated, and if it spills in your pack, it's a big smelly mess. The smell will persist for some time to come, quite possibly the life of the pack. One typically must carry alcohol as a priming fuel. Priming with kerosene alone is well nigh unto an act of desperation. Ever clear at your local liquor 190 proof as cheep as it gets and you can drink it burns hot no mess. Unfortunately high proof liquor is illegal in many states, but I'm curious: How much does it cost and how big is the bottle? Isopropanol is not toxic through skin absorption... It is used in hospitals (external use for massaging painful muscles). Methanol IS toxic through skin absorption. Methyl Hydrate is a synonym of Methanol (not a mix of Ethanol and Methanol).